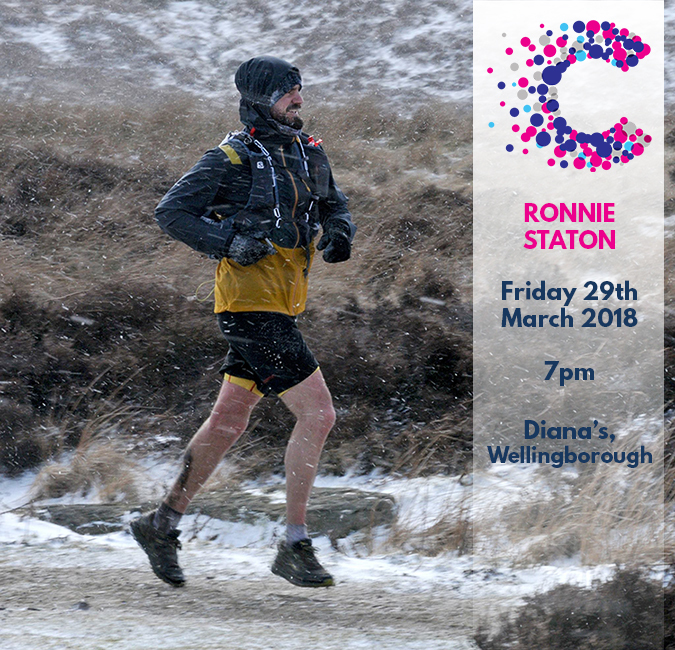 Join us at Diana's in Wellingborough on the 29th March for a talk led by Ronnie Staton, Race Director at HoboPace. All proceeds from the evening will be donated to Cancer Research towards my target of raising £3000 in the build up to the London Marathon, following several losses in the family to cancer within the space of a year, including my Mum. There will also be a raffle to raise funds on the night and a bar will be available for refreshments. Ronnie has been working with goals for nearly 20 years. Originally a Personal Trainer working with a range of clientele he began to see that similar mindset patterns clearly lead to an improved success rate in achieving goals. Over time Ronnie became qualified as a Stress Management Consultant to better help individuals within this non-physical realm and continues to develop this side of his coaching currently studying Cognitive Behavioural Therapy. Over the last decade however, Ronnie has become increasingly passionate in the world of ultra running! In 2013 Ronnie ran 190 miles non-stop across England taking only a ten minute power nap, it took 55 hours to complete the run which passed through some of England's toughest terrain. Through personal experience and coaching Ronnie illustrates that inner purpose can overcome the plight of the negative mind and how in discipline, perseverance and self belief a level of freedom can be found. Ronnie works from a philosophy of inspired empowerment to find one's true aspirations. No matter how grand or small fulfilment is equal and universal to everyone who seeks it and ultimately success comes from having the right mindset and not purely opportunity. More recently In 2017 Ronnie ran across Wales from Holyhead to Cardiff Bay (253 miles) in 77 hours whilst provided only water, no other support and no shelter bringing into play a huge self management factor to the event. Then in 2018 Ronnie ran across Scotland from Portpatrick to Cockburnspath (Southern Upland Way) 214 miles in 72 hours. Naturally, he now has his sights on running across Ireland! Ronnie works with ultra runners from around the UK tackling anything from 30 miles up to 300 miles and in doing so has gained an in depth insight into how people succeed. At the end of 2018, Ronnie suffered a stroke. "I did not chose the stroke but I can chose not to let this break me. Such conscious choice in how I see this situation is the only way I can get through this without experiencing unnecessary suffering. I’m not asking why me and I refuse for a second to feel sorry for myself. Why not me, in fact if this had to happen to anyone close to me I’d have chosen me. Everything I’ve gone through up to this point has prepared me well for this most difficult journey that now lay ahead. "